BL23 (腎兪) : first, you estimate the point on your back where right behind the navel. From behind the navel, take the point two fingers outside. This point is BL23. BL25 (大腸兪) : connect the top of a pelvis on both side. The middle of this line on lumbar vertebra is GV4. From GV4, two fingers outside is BL25. BL27 (小腸兪) : measure the length of the BL25 and BL23. connect with BL25 and BL23 in a line. On an extension of that line, take this length from BL25, it is BL27. Measure the width of your lips. Make a triangle on your stomach. 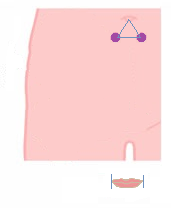 Each side should be your lips size and the top of this triangle should be the navel then use the two points of the bottom of the corners of this triangle.